Summer is SO close we can taste it! 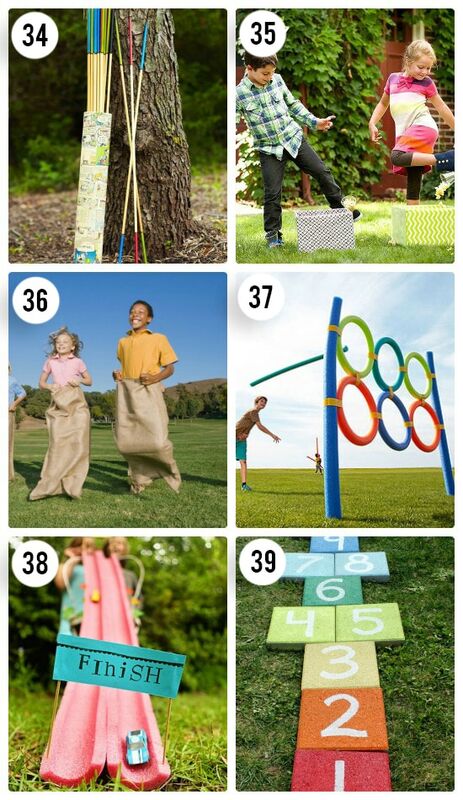 And with it comes warm weather, pool parties, play dates, and you guessed it… fun outdoor games! And not to mention having our kiddos ALL to ourselves! Woo hoo! Anyone else start to miss those little crazies once Spring rolls around? 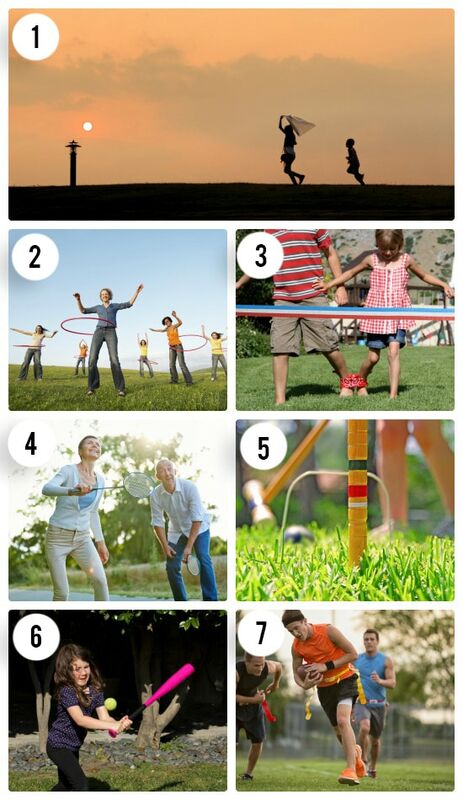 Soak up every second with them this Summer with some of our fun outdoor games for kids! And don’t worry, we’ve got the grown-ups covered too with our fun outdoor games for adults. 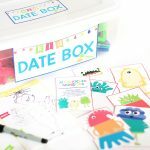 Do you have a birthday coming up this summer? We’ve got party games, too! We take summer fun very seriously around here, so when it comes to fun games to play outside… you’ve come to the right place. Now go! Get outside and take advantage of sunshine and friends this summer, with one or MANY of our 65 Fun Outdoor Games! From classics to DIY, we’ve got plenty to keep you busy all summer long! Grab the kids or your neighbors and get this party started! 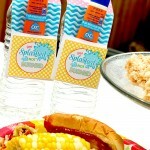 Are you ready to start planning your summer fun?! Well, here we go! 2. Hula Hoop Competition – Let’s see just how well you can move those hips! Gather your close friends and some inexpensive hula hoops and see who can hula hoop the longest. You’d be surprised just how much of a work out it really is. 3. Three-Legged Race – Choose your partner wisely for a three-legged race! 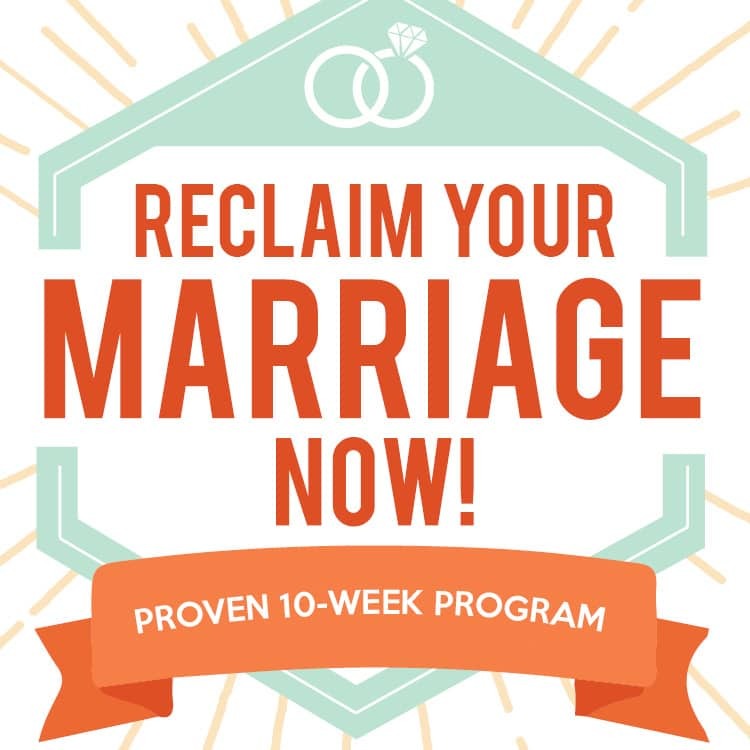 We suggest grabbing your spouse. You two should be well in sync with each other already…don’t you think?! 4. Badminton – Badminton is one our favorite fun outdoor games! Set up a backyard net and host a friendly badminton tournament with neighbors, family and/or friends! 5. Croquet – This old time classic is still sure to be a hit! Another great game to teach the kiddos! 6. Backyard Baseball – Whether you’re setting up t-ball for the kids (this set is great for 3 and under) or throwing up some balls for you to hit out to friends, backyard baseball is a true American classic. 7. Flag Football – Be sure not to leave the ladies out of this one! In fact, a little flag football might be the perfect way to flirt a little with your spouse while enjoying the nice outdoor weather. To make things easy, you can grab this Capture the Flag set from Amazon. 8. Ladder Golf – Opposing teams take turns throwing 3 bolas on the varying rungs of the ladder. The first team to 21 wins! You can grab the game here. 9. Volleyball – With or without a net, you can volley a ball in the backyard with your family or friends. But to add a little friendly competition, set up a net and create a two-team tournament! This is definitely one of our most fun outdoor games! 10. Tug of War – Flex those muscles! Grab a rope out of the garage and see just how strong you really are! Make sure to create balanced teams…it’s only fair! 11. Horse Shoes – This is one of the more classic and fun outdoor games… RINGER! Take turns tossing your horse shoes to the stake. First to 15 wins! 12. Corn Hole – The new backyard FAVORITE, corn hole is hit well into tail-gating season! You can make your own, or buy a set here. If you haven’t gotten on board with this game yet, you’re missing out on some competitive fun! 13. Frisbee Golf – This is an at-home way to set up Frisbee Golf! 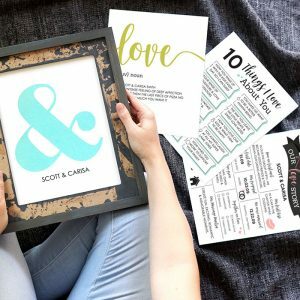 It even includes printables and a fun twist if you want to play with just your spouse! I actually have this frisbee golf disc set, and it’s great for beginners! Fun outdoor games, here we come! 14. Mini Golf Course – Who doesn’t love a round of mini golf?! Creating your very own course will have your house the hit of the neighborhood. And we have the perfect Mini Golf Date if you and your babe wanna head out on the town! Fun outdoor games just got a whole lot better! 15. 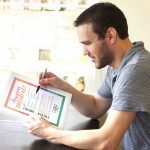 Plinko – Create your own Plinko board for a unique game to have on hand for your next BBQ! Take turns dropping chips, aiming for the higher valued points along the bottom. The first player to 21 WINS! And if you don’t want to make your own, you could buy one, here! 16. Ring Toss – As simple as this game is to play, it’s equally as simple to make. This can be “tossed” together quickly for a last minute party! 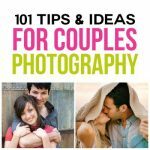 You can also buy one here if you find yourself short on time and creativity! 17. Angry Birds Backyard Edition – No way! Real, live Angry Birds! This game is beyond creative and one of our most fun outdoor games yet! 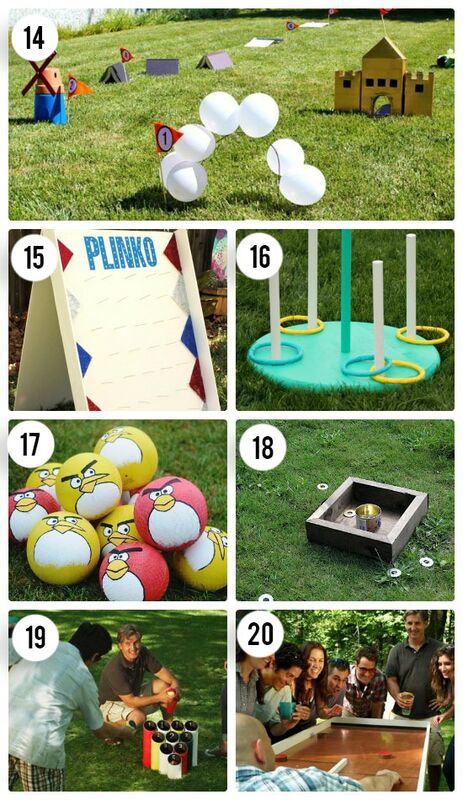 With some four square balls, DIY launcher and cardboard boxes, you’ll be making your own Angry Bird game right in your back yard. 18. Washers – Nothing says Fun Outdoor Games like a game of washers. With items you surely have kicking around in your garage, you can easily whip up the pieces necessary for a game of washers. Just toss the washers, aiming for the cup, until the first person scores 11 points! 19. Pipe Ball Toss – Cut piping into varying heights, adhere together and grab a ball! Take turns tossing the ball into the tubing! Who said fun outdoor games had to be complicated? 20. Ricochet Table – A twist on the classic shuffleboard, turn a door into a ricochet table for the backyard! 21. Vertical Ring Toss – This link is no longer available 🙁 but to avoid getting bored with the standard ring toss, switch it to vertical board! With few materials, this game can be “tossed” together quickly! Just get a board and attach some buckets with point values and get tossing! 23. Kubb Game Set – Have you heard of this game?! It’s described as a cross between bowling and chess…interesting huh?! Introduce it to friends and family and start a new tradition! You can also take a whack at making your own! 24. Balloon Dart Board – One of our more simple and fun outdoor games! Adhere balloons to a board and shoot darts at them. Make it interesting by giving point values to different color balloons! Of all of our fun outdoor games, this one might be our favorite! 25. LCR Dice Game – What’s that you ask? Roll the dice and pass your chips according to the letter you land on! The idea is to be the last one with all the chips! 26. Irish Bowling – This link is no longer available 🙁 But to play you take turns knocking blocks out of the rings using round pieces, called pelters. If you knock a block down, you score the number of the ring in which the block lands. Person with the highest score after a set number of rounds WINS! Another great game to continue into tail-gating season! 27. Crab Soccer – How fun does this look!? When it comes to fun games for kids, crab soccer is where it’s at! In the crab walk position, use an over-sized ball to score against your opposing team. This definitely puts the “FUN” in out fun outdoor games list! 28. Backyard Obstacle Course – This is great because you can use any items you have laying around the house to create the ULTIMATE obstacle course for your kiddos. When they get bored, switch up the course and it will keep them busy for HOURS! 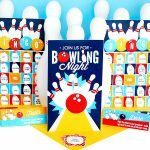 One of our favorite fun games for kids yet! 29. Bucket Toss – Another simple game to put together that will entertain a group of kids at a birthday party or BBQ. 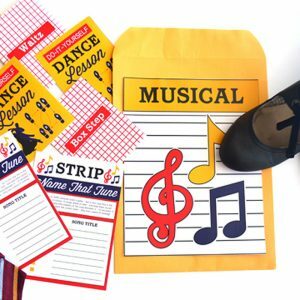 Grab some cheap party goodies as prizes and you’ll be even a bigger hit! 30. Chalk Obstacle Course – Kids LOVE chalk. Have them help you create an obstacle course on the sidewalk. Heck, join them for a round or two! I really love egg-shaped sidewalk chalk – easy for little hands to hold! 31. Bobbing for Donuts – Um, DELICIOUS! This idea is to die for, you might just have to take a turn! Hang tasty donuts from strings and have the kids go to town! If this doesn’t say, “fun outdoor games”, we don’t know what does! 32. Bean Bag Can Toss – Not only this is one of our fun games for kids, but it’s another great use for recyclables! 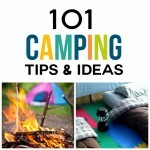 Have the kids assist you in decorating the cans and then set them up to knock right back down with bean bags! 33. Freeze Tag – Nothing says “fun games for kids” like freeze tag! This oldie but goodie is a great way to get the kids some exercise! Let them burn steam while playing a round or TEN of freeze tag! 34. 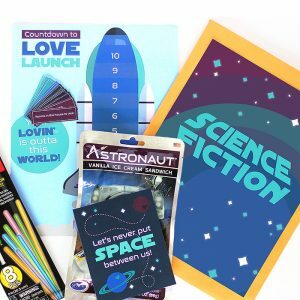 Extra-Large Pick Up Sticks – This is one of our favorite fun games for kids. Dump the sticks into a big, messy pile. Let kids take turns picking up a stick. If the stick they choose wiggles/moves another stick, they must put the stick back and pass on their turn. The kids with the most sticks at the end WINS! Fun outdoor games just got even MORE fun! 35. Popcorn Dump Race – Secure a cup to a rubber band for each team. The kids on each team will take turns strapping the cup to their shoe, scooping popcorn into it and walking it over to a box to dump. The team with the most popcorn at the end of the allotted time WINS! 36. Potato Sack Races – These classic and fun outdoor games are easy to organize. Even if you don’t have a potato sack, a pillow case will do the trick! 37. Noodle Olympics – When it comes to fun games for kids, this will for sure be a crowd favorite! Use your noodles for more than just the pool. 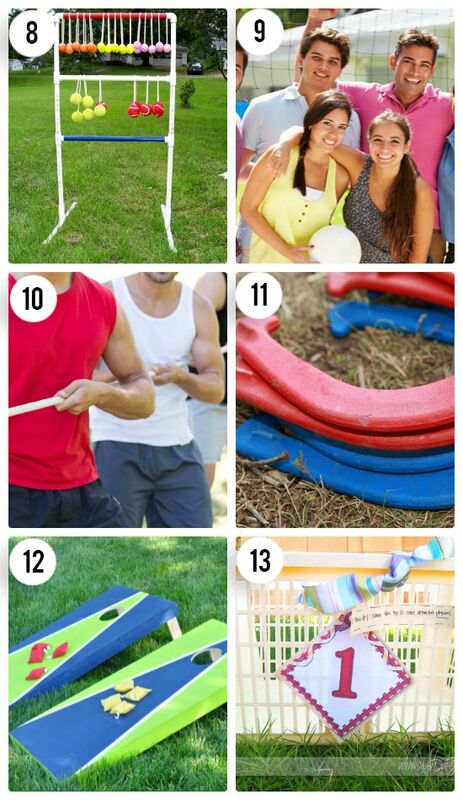 Duct tape them to create various events and set up the Noodle Olympics right in your back yard! 39. Hopscotch – Fun outdoor games at their best! Hopscotch! This classic can be recreated on pavers or by simply using chalk on the sidewalk. A great activity to set up during your next BBQ. 40. Chess – How cool is that?! Turn a section of your backyard into a large chess board for all of your yard games needs! This example is so beautifully done! 41. Connect 4 – This life size version of Connect 4 is not only great for outdoor parties but weddings as well! It’s one of those fun outdoor games that never gets old! 42. Memory – How good is your memory?! Will the fresh air help it any?! 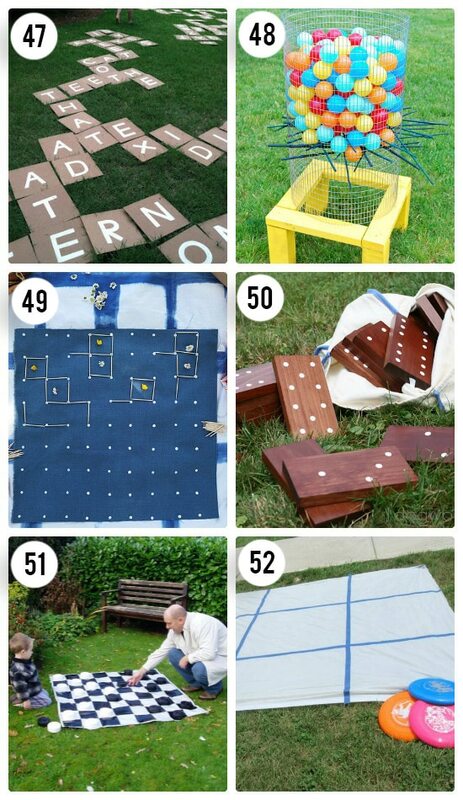 For these yard games, grab some cork tiles and some stencils and see with a game of yard memory! 43. Jenga – Another great classic and one of our favorite fun outdoor games, this game can be played as stated by the rules or you can add your own fun twists as you go. That is the beauty of the game Jenga! 44. Chinese Checkers – Can you imagine sitting on your board game?! With this yard size Chinese Checkers you can do just that and STILL play! That’s part of the fun of yard games! 45. Yard Yahtzee – LOVE Yahtzee! An extra-large yard size sounds even more fun! 46. Twister – One of our favorite fun outdoor games so far! 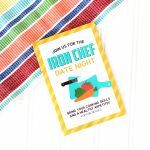 Spray paint your very own Twister board on the grass for a fun and flirty activity for just you and your spouse or a fun group date! Yard games work for big or small groups! 47. Bananagrams – This is one of the newer yard games out there. You’ll need a large yard to be able to expand upon all of your words but it sure looks fun! 48. Ker-plunk – One of our more creative fun outdoor games, an extra-large Ker-plunk game! Grab some ball pit balls or maybe fill it with water balloons for an added twist! 49. 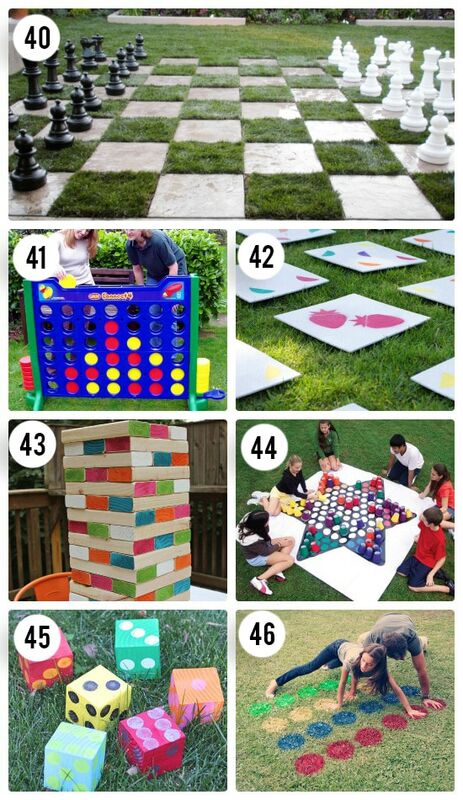 Squares Game – These “yard games” are great for keeping the kids busy at restaurants but why not in the backyard as well? It’s also a great one to pack up for a picnic at the park! 50. Dominoes – It seems that any game can be made into a yard games. So why not try dominoes outdoors!? 51. Checkers – Teach your kids how to play checkers for the first time this summer with an outdoor rug board. It’s also a great piece to pull out during BBQs for guests to take turns playing while they visit with others. This is one of those fun outdoor games that you can play over and over! 52. Frisbee Tic-Tac-Toe – A twist on the pen-to-paper Tic-Tac-Toe! Grab a frisbee and aim for a spot, hoping you can get three in a row before your opponent fills in your needed spot! Yard games just got a whole lot more fun! 53. Water Balloon Piñata – Hang water balloons from a suspended area and take turns hitting them until they burst. This takes “fun outdoor games” do a whole new level! 54. Melt the Frozen T-shirt Race – Using frozen t-shirts, two teams will race to see who can get theirs to defrost the fastest. The team must be able to get one member of their team to put on the shirt to WIN! 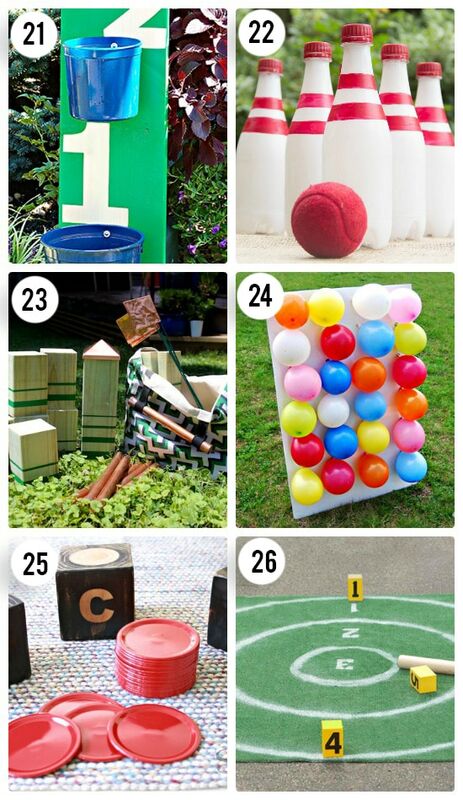 One of the most simple yet FUN outdoor games for kids! 55. Soap Boat Races – This is true, CLEAN fun! One of the most fun outdoor games in here! Two teams race soap bars down a stream of running water! 56. Squirt Gun Shooting Practice – Set up two rows of golf balls on tees and have two people race to see who can shoot all of the golf balls off first. 57. Foot Fishing for Marbles – Who needs fishing poles when you have feet?! Two people will race to see who can remove the most marbles out of a bucket of water using only their feet. 58. Flipper Fill Up – Two teams will race to see who can walk across the yard with a bucket of water on their head to fill up another bucket! The catch….you must be wearing flippers as you do this! A family favorite out of all of these fun outdoor games! 59. 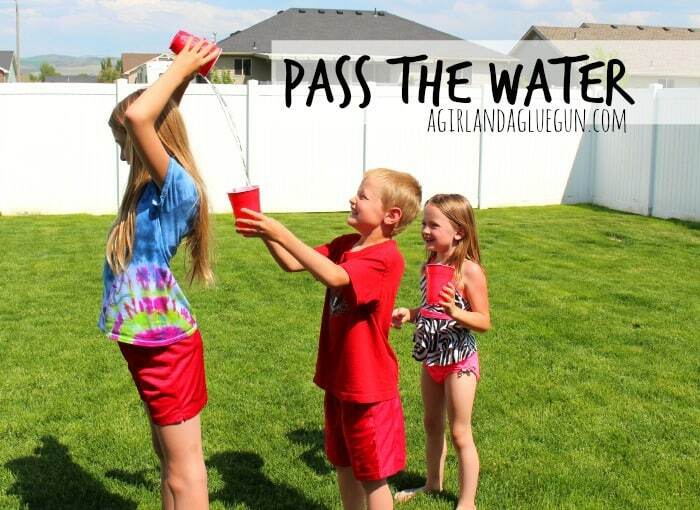 Pass the Water Race – Fun outdoor games for kids just got a whole lot MORE fun! Two teams will line up next to each other and pass water over their heads into the person’s cup behind them. The last person will be filling up a bucket. The team with the most water in their bucket at the end WINS! 60. 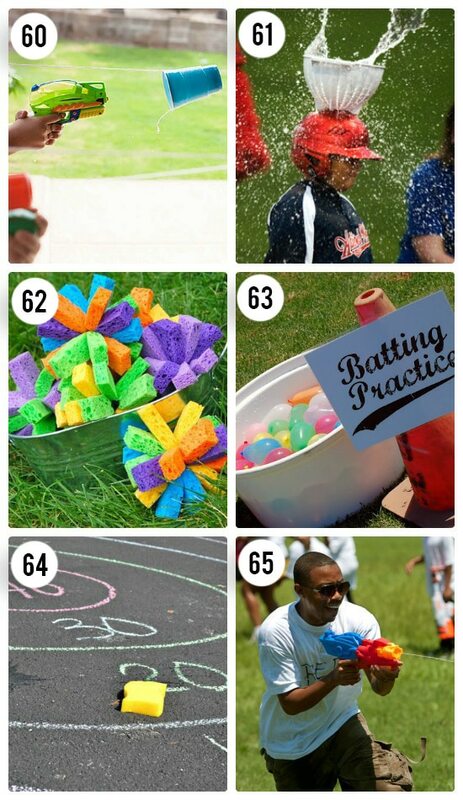 Water Cup Races – Cool off with these fun outdoor games for kids. Hang cups on a string and race to see who can squirt their cup across the string to the other side first! 61. Catch the Water Bombs – This link is no longer available 🙁 SPLAT! Place a bucket on a helmet and have one member of the team wear the helmet. See how many water balloons they can catch in the bucket on their head. 62. Sponge Bombs Bucket Toss – Another one of our favorite fun outdoor games! Creating your very own sponge bombs, use them for a twist on the classic bucket toss. 63. Water Balloon Batting Practice – Set up a tee and use water balloons as a fun twist on batting practice. 64. Sponge Bullseye –This link is no longer available 🙁 but using chalk, draw a bullseye on your driveway. Then use sponges to see how many points you can score by tossing them into the bullseye. EASY PEASY! 65. Water Gun Fight – This is another oldie but goodie with our fun outdoor games. Definitely one of our favorite fun outdoor games. Equip everyone with a filled water gun and let the games begin! Have a water gun fight! If you’re hit, you’re out. The team who eliminates all the members of the other team first WINS! Feeling a little overwhelmed with options!? Good thing you have 3 months of summer to try as many as you want! 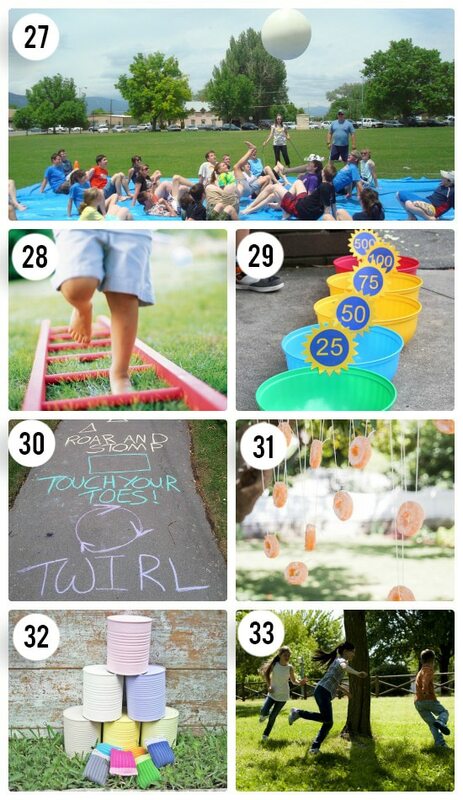 Try one of our 30 Block Party Ideas with some of the above listed games and have yourself the ULTIMATE summer! 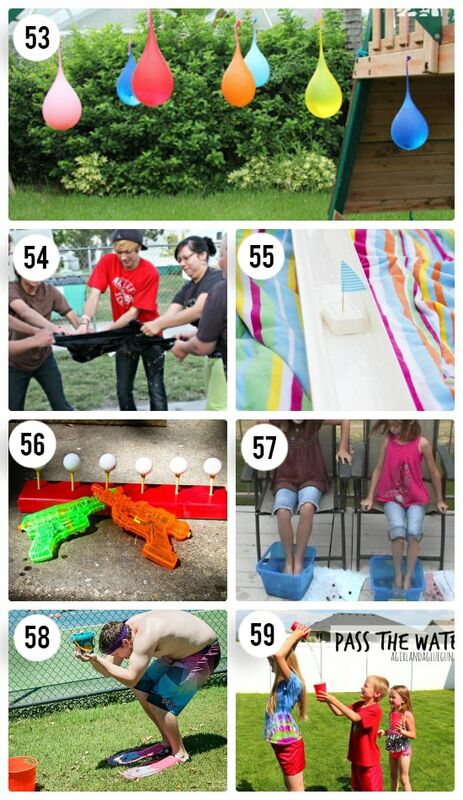 And for the kids, try one and MANY of our 101 Summer Boredom Busters! We also rounded up The Best Family Outdoor Games! This summer will be anything BUT boring! They look great and creative. Great! So glad you like some of these ideas! There are so many to choose from! Enjoy! Thank yoU!!! Hope you enjoy trying them out with your family! This is amazing! We are planning an old country fair themed wedding reception with tons of games. All the good parts of a family reunion with a carnival of yard games and this page goes beyond what we had planned! I was feeling a little cliche and now the rewrite of events begins! Thank you!!! Summer is coming and all these outdoor games are excellent. Thank you very much Paige for this list! 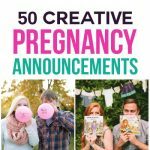 Now I have enough game list to share with my kids and such a long long list and really the list is endless! Looking forward to sharing with my kids. thanks, Paige for such a wonderful menu. Hope your kids love them as much as our kids have! creative person & creative ideas. Love so much your classic & children list. Thanks for helping me plan exciting games for our family reunion!